In keeping with the theme “EatDrinkHilton”, Hilton Colombo will be dishing out a series of interesting promotions throughout the month of September. “Strawberry” being the flavor of the month, Executive Chef Robert Mujagic together with his team will be churning out a variety of strawberry infused dishes that will be available at the restaurants at Hilton Colombo. To kick off the season, a Strawberry High Tea Buffet will be on at the LAB (Lounge & Bar)on the 4th of September from 3pm to 6pm priced at Rs2500nett per person.A special 3-course strawberry infused menu will be available at GRAZE KITCHEN – Appetizer; Watermelon carpaccio, pan-seared scallops with strawberry salsa and chutney. Tea Smoked Duck Breastwith strawberry braised red cabbage, green pea mouse and balsamic garlic jus for mains and for dessert a meringue shell with strawberry cremeux, chocolate ganache quenelle, almond crumble & fresh strawberry. IKOI TEI will feature a mini a la carte menu consisting grilled strawberry and chicken skewer with yakitori sauce, a sweet strawberry sushi roll coated in roasted coconut and Strawberry Mochi; Fresh strawberry wrapped in sweet red bean paste for dessert. At LAB one must try the Strawberry Sensation, a strawberry decadence with macaroon, strawberry compote, cream quenelle on chocolate soil & meringue! Strawberry cocktails and mocktails will also be on the menu. The Strawberry & Dark Chocolate Chia Pudding at CAFÉ KAI amongst the many other decadent cakes and gateaux, pralines, truffles and macaroons will definitely inspire you to visit more than once! In addition, there will also be a strawberry trolley serving up some healthy options like strawberry yogurt oat protein bars with wild honey, strawberry & quinoa protein bars with lime, strawberry granola protein bars with coconut & cinnamon, homemade strawberry chia seeds jam and strawberry - coconut jam. 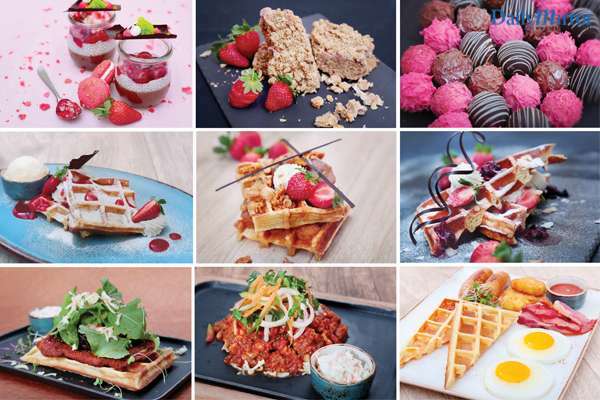 Furthermore, Its’“Wafflicious Madness” at CAFÉ KAI from the 3rd to 12th September. Taking wafflesto the extreme, different treats in the form of savory and sweet will be available to drive the entire family wild with happiness! The savory selectionranges from the breakfast waffle “Wake n Waffle”;a Kai waffle with two fried eggs, hash brown potatoes, bacon, homemade pork sausage and BBQ apple sauce to “Bacon and Egg Melt”; Kai waffle, pancetta bacon, two scramble eggs, maple-glazed and cheddar cheese,“Sloppy Joe” - waffle sloppy joe slider with ground beef, greens, onion, jalapenos, baked beans, tomato and grated mozzarella cheeseand the “Chicken and Waffle Sandwich”; buttermilk-fried chicken, caramelized onion, bacon jam and rocket on Kai waffle. For those with a sweet tooth, the “Banana Foster”; a sweet waffle sandwich with banana, walnut, peanut butter, topped with wild honeycomb and chocolate is a must try. For berry lovers the “Berry Medley”; Kai waffle with strawberry coulis topped with whipped cream and vanilla ice cream or the “Bounty Island” - Kai waffle with roasted young coconut, mixed beery compote, cream and a lot of icing snow is sure to take your taste-buds on a wild spin! So make it a date at Café Kai for a waffle, be it after dinner, a quick lunch bite or at any time between 11am and 10pm. For more details contact the F&B Reservations Desk on 2492492. www.hitoncolombo1.com. fb/HiltonColombo.